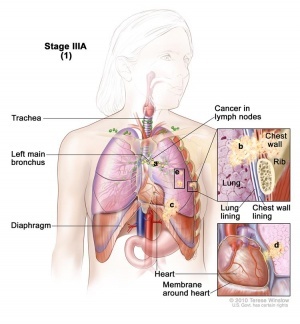 Small-cell lung cancer is a less common type that accounts for about 15-20% of cases and usually spreads faster than non-small-cell lung cancer. It is often at a more advanced stage when it is diagnosed. This type of lung cancer, which has the strongest association with cigarette smoking, leads to the worst prognosis due to it’s rapid growth. Lung cancer is one of the most common and serious types of cancer. It is the second highest cancer incidence in both males and females, following prostate cancer in men and breast cancer in women. It is diagnosed in over 41,000 people every year in the UK and is the leading cause of cancer death around the world. In 2008, lung cancer contributed to 13% or 1.6 million of total cancer cases and 18% or 1.4 million cancer-related deaths worldwide. Lung cancer incidence and mortality rates are highest in the United States and developed countries and almost 9 in 10 lung cancer cases occur in people aged 60 years or older. Cigarette smoking is the leading cause of lung cancer and accounts for about 85% of diagnosed lung cancer patients. Smoking is also most strongly associated with small cell lung cancer and squamous-cell carcinoma. Risk for lung cancer increases with how long a person has been smoking, the amount they smoke and the depth of smoke inhalation. Second-hand smoking also causes lung cancer, but is less strongly associated compared to active smoking. Cigarettes contain more than 60 carcinogens that have been shown to induce cancers. Nicotine causes addiction to cigarette smoking and has been shown to inhibit apoptosis, proliferate cells, and cause angiogenesis in lung tumours. Cigar and pipe tobacco smoking produces relatively large particles that only reach the upper airways, where cigarette smoking reaches the distal airways because it produces fine particles. Therefore, the risk of lung cancer is lower with cigar and pipe smoking. Smokers of all ages will benefit from the cessation of smoking, but the risk of developing lung cancer will still be increased compared to never smokers. Never smokers are individuals who smoked fewer than 100 cigarettes in their lifetime but this still accounts for 25% of lung cancers worldwide. A number of environmental risk factors have been identified, most of which often relates to occupational exposures such as asbestos, tar, soot, and a number of metals such as arsenic, chromium, and nickel. Air pollution has also been linked to increased risk of lung cancer. Radon gas has been posed as a significant risk factor for lung cancer as well. Genetics There is a genetic susceptibility which increases the risk of lung cancer among first-degree relatives. A CT scan or Computerised (axial) tomography scan, usually carried out after a chest X-ray, takes a series of x-rays at different angles and through the use of computer processors produces a series of cross-sectional images of specific areas of a scanned object, allowing the user to see inside the object. This scan gives a very accurate picture of where a tumour is and its size. Before having a CT scan, you will be given an injection of a contrast medium. This is a liquid containing a dye that makes the lungs show up more clearly on the scan. The scan is painless and takes 10-30 minutes to complete. 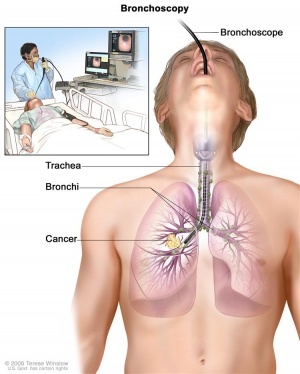 A bronchoscopy is a procedure that allows a physician to remove a small sample of cells from the inside of the lung using a bronchoscope. The bronchoscope is a small tube like device which is passed through the mouth or nose and down through the throat into the airways. This procedure is slightly uncomfortable however it is relatively quick and only takes a few minutes. According to the NHS there is currently no national screening program for lung cancer in the UK. The lack of a National screening program is due to the complexity of the tests required to identify lung cancer. No simple, and quick test sensitive enough to outweigh possible risks associated with screening is yet available (ex. radiation exposure during x-rays). Cancer induced proteolysis and lipolysis leads to loss of muscle and adipose tissue. Nicotine replacement therapy (NRT): Available in many forms including gum and a transdermal patch. All forms of nicotine replacement increases the rate of quitting by 50-70%. Nicotine receptor partial agonist: varenicline is more effective than bupropion and NRT. 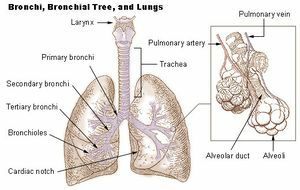 Aerobic exercise and resistance training have a positive impact on lung functioning including a reduction in airflow obstruction and clearing of airways therefore the improved functional capabilities increase energy levels and the release of sputum. Exercise programs should be supervised by the treating clinical team and should also be discussed with the general practitioner before participating in any exercise program. Surgery Surgery involves a resection of the tumor and some normal tissue around it. This is the first line of choice of treatment for non-small cell lung cancer patients who are medically fit to undergo surgery. Radiation therapy is a form of treatment that is indicated for patients with stage I, II or III of non-small cell lung cancer. 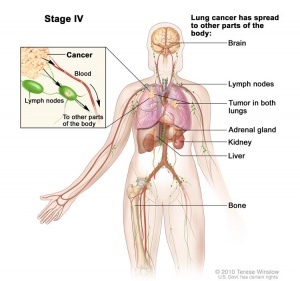 With respect to lung cancer, stages I, II, and III determine various sizes of primary tumor and lymph node involvement without distant metastasis and any distant metastasis is automatically stage IV. It is also used in combination with surgery for non-small cell lung cancer and with chemotherapy for small cell lung cancer. 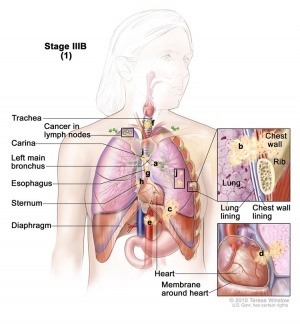 Chemotherapy The first line of treatment for small cell lung cancer, which are often spread upon clinical presentation. 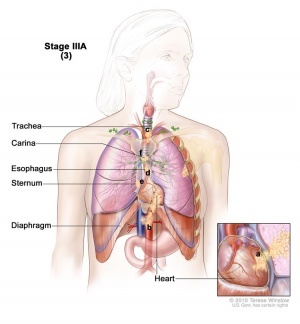 It is also indicated for patients with more advanced stage of non-small cell lung cancer to improve prognosis, disease control or for palliative care. The best way to prevent lung cancer is to quit smoking. The risk of getting diagnosed with lung cancer will decrease the sooner an individual quits smoking. After 10 years of not smoking, the chance of developing lung cancer decreases to half that of someone who smokes. Diet Research suggests that eating a low-fat, high-fibre diet, including at least five portions of fresh fruit and vegetables and whole grains every day, can help reduce the risk of developing lung cancer, as well as other types of cancer and heart disease. Studies show that higher levels of physical activity may lower lung cancer risk. It is important to exercise regularly, attempting to perform at least 150 minutes of moderate intensity aerobic activity each week and incorporate muscle strengthening activities two days per week. 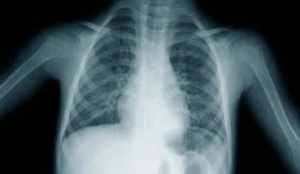 Some research has found that taking aspirin may reduce the risk of getting lung cancer. Other studies have found that aspirin may only reduce risk in people who take aspirin daily or may only reduce the risk in men. It is important to check with a doctor before taking aspirin every day as it can damage the lining of the stomach and potentially cause bleeding. 1. Yoder LH. 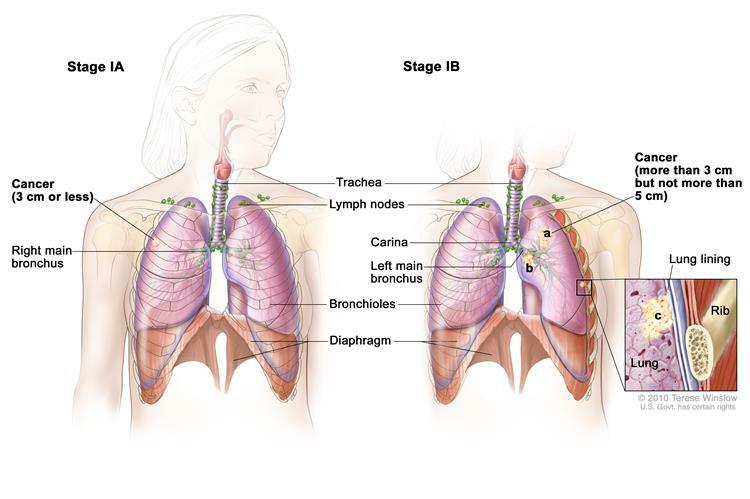 An overview of lung cancer symptoms, pathophysiology, and treatment. Medsurg Nurs. 2006;15(4):231–4. 2. McMaster Pathology Review. Lung Cancer. www.dh.gov.uk/PolicyAndGuidance/fs/en (accessed 22 May 2015). 5. Dela Cruz CS, Tanoue LT, Matthay R a. 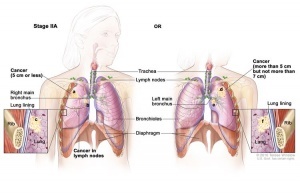 Lung Cancer: epidemiology, etiology and prevention. Clin Chest Med. 2011;32(4):1–61. ↑ 1.0 1.1 1.2 1.3 1.4 1.5 1.6 1.7 1.8 Yoder LH. 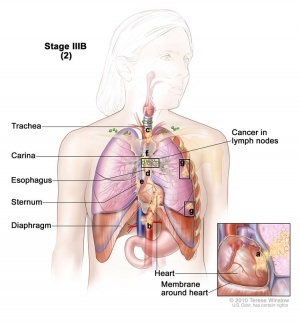 An overview of lung cancer symptoms, pathophysiology, and treatment. Medsurg Nurs. 2006;15(4):231–4. ↑ 2.00 2.01 2.02 2.03 2.04 2.05 2.06 2.07 2.08 2.09 2.10 2.11 2.12 2.13 2.14 2.15 2.16 2.17 2.18 McMaster Pathology Review. Lung Cancer. www.dh.gov.uk/PolicyAndGuidance/fs/en (accessed 22 May 2015). ↑ 6.0 6.1 6.2 6.3 6.4 6.5 6.6 6.7 Dela Cruz CS, Tanoue LT, Matthay R a. 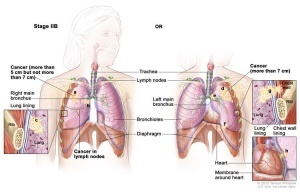 Lung Cancer: epidemiology, etiology and prevention. Clin Chest Med. 2011;32(4):1–61. ↑ Lee IM. Physical activity and cancer prevention--data from epidemiologic studies. Medicine and science in sports and exercise. 2003 Nov;35(11):1823-7. ↑ Rothwell PM, Wilson M, Price JF, Belch JF, Meade TW, Mehta Z. Effect of daily aspirin on risk of cancer metastasis: a study of incident cancers during randomised controlled trials. The Lancet. 2012 Apr 28;379(9826):1591-601.